It ships in packaging that mimics a bird box and gets its name from the sound it makes when it's lost, but there's precious little Tweeting to be heard on this otherwise social media-savvy smart watch. Cookoo, a Kickstarter project (what new gadget isn't?) manufactured by Hong Kong's Bluetrek Technologies, is a Facebook watch. Designed to work exclusively with iOS devices (iPhone 4S, iPhone 5, iPad mini, iPad 3, iPad 4 and iPod touch 5th gen), Cookoo is all about notifications. It hooks up to your Apple device via Bluetooth and demands that you download the free Cookoo Time To Connect app and enter some basic details and Facebook credentials. It can integrate with everything from email and phone calls to Facebook and calendar events, though it's a pretty basic service that appears to revolve around a few beeps or vibrations (subtly different alerts can be set for different events). Meeting at midday? Cookoowatch will issue a small beep at a pre-determined time beforehand, though for any details - such as location or conference call dial-in numbers - you'll have to reach for your iPhone. Ditto Facebook. While a beep letting you know about a direct message is understandably basic, Cookoo's active Facebook features are pretty rudimentary, too. Fancy checking in on Facebook without fetching your phone? It's possible, but only partially. The Cookoo will wake up your phone and locate you on a map, but to actually post it on Facebook you'll have to use the phone. All this is done within the Time To Connect app rather than the official Facebook app, so it's a rather basic, initially unfamiliar app environment, too. A similar Share Your Location one-button feature exists on the Cookoo, too, though to us that sounds downright dangerous (during our test we accidentally shared our home address with the entire world). Other features make more sense. Incoming calls on your iPhone produce a beep from Cookoo, and so can emails, though of course if you get a lot of junk email, this is best avoided. Lost your iPhone? Press the command button and the Cookoo will, err, 'cookoo'. It also beeps when the watch is running out of battery, which is mercifully rare. Perhaps the saving grace of Cookoo is that it doesn't have an LCD screen, just a regular - and rather anonymous-looking - clock-face that runs on a regular CR2032 battery. So you can count on just changing it every few months. 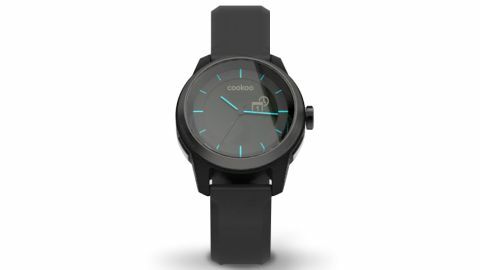 However, that lack of an LCD screen restricts Cookoo to being a simple notification watch, priced at US$129.99 (around £85 / AU$140). And if you think Cookoo's core features are rather basic, what about what it can't do? No text message alerts? Seriously? What about Twitter, too? Cookoo has few must-have features and some notable gaps. Hands-free calling and text message alerts are off the menu, while in-watch Facebook check-ins simply add another layer of complexity. It's a decent watch for everyday use - it tells the time and it's waterproof, too - but we're not sure it's the smartest cookoo in the box.